To save his company, Martin Pochtaruk had to split it between Canada and the United States. Eight years after he founded Heliene Inc., a solar-panel manufacturing firm based in Sault Ste. Marie, Ont., opportunities have all but dried up in Ontario. The province’s Green Energy Act, enacted in 2009 as the economy was coming through a major recession, should have created a windfall for firms such as Heliene. It was also meant to create thousands of well-paying manufacturing jobs in a place that was bleeding them, while positioning Ontario at the vanguard of green energy innovation. That vision is now dead. In fact, it never really materialized. It fizzled out as electricity demand stagnated and rising prices created a political backlash. More recently, new Premier Doug Ford kneecapped the renewable-energy sector, axing 759 solar, wind and small hydro contracts – including a wind farm already under construction in Prince Edward County – in the name of cost savings. Heliene’s survival strategy? Expand to the United States and downsize operations back home. At the plant in Sault Ste. Marie, Mr. Pochtaruk has reduced his staff from a high of 112 employees to 70. Forty-eight of those are employed under a federal job-share program that has them work half the time and collect employment insurance the other half. A new plant in Minnesota will employ almost twice as many Americans. Heliene Inc. president Martin Pochtaruk has been forced to open a plant in the United States to rescue his eight-year-old firm based in Sault Ste. Marie, Ont., which manufactures solar panels. Heliene is emblematic of the seismic challenges facing Canada’s renewable energy business. Whipsawed by shifting government policy, many companies have no choice but to chase opportunity in more favourable markets, such as Alberta and Saskatchewan, only to find stiff competition from deep-pocketed foreign rivals. And, as Ontario has proven, abrupt changes in governance could all but put the renewables industry on life support, reducing it to a shell of what policy-makers envisioned. The fledgling Canadian industry – barely a decade old and nurtured by government policy – is now at a crossroads. It must prove it can compete with traditional electricity sources and seek out customers eager to generate their own sources of power rather than rely on major utilities. At stake is Canada’s participation in the global energy economy of the 21st century, as new technologies increasingly enable a “smart” grid that features small-scale sources of electricity, aggressive policies to manage demand, as well as new storage options that eliminate concerns about running low on power. While prices have plummeted, wind and solar are still not always able to supply power when it’s needed. Still, even with those problems and the retrenchment in Ontario, the National Energy Board projects solid growth for renewable-power generation for the next two decades. It bases that view on the prospect of even lower solar and wind prices, making them increasingly competitive, as well as continued policy support from governments. In fact, the NEB long-term growth forecast is rather modest – at least compared with the dream of a power grid that is 100-per-cent supplied by green energy. The board sees renewables producers roughly doubling their share of the electricity market to 13.5 per cent by 2040, with total generation set to grow by 13.2 per cent over that time. By way of comparison, natural gas is forecast to increase from 9.7 per cent to 17.5 per cent of total power generation. But the renewables industry – wind, solar, small-scale hydro and biomass – is seen as an integral part of the transition to a low-carbon economy being championed by the federal Liberal government as Canada engages in the global battle against climate change. Ottawa has a long-term goal to virtually eliminate coal- and gas-fired power and rely on non-emitting sources for electric cars and even heating homes and offices. Compared with other countries, Canada has an advantage in the fight against climate change. About 82 per cent of the electricity we consume already comes from non-emitting sources – large-scale hydroelectric dams in Newfoundland and Labrador, Quebec, Manitoba and British Columbia and a combination of hydro and nuclear power in Ontario. In some respects, the dominance of such traditional power sources makes it harder for renewables to compete. In many provinces, wind and solar producers must edge out entrenched power generators with deep, historical ties to government – often public utilities – and powerful political constituencies. Mr. Ford recently visited Ontario Power Generation’s Pickering nuclear plant and vowed to keep the aged facility open to protect the 7,500 direct and indirect jobs that depend on it. He made no mention of the jobs that will be lost in the renewables sector with the cancellation of those 759 contracts. The National Energy Board projects solid growth for renewable-power generation for the next two decades as the cost of producing solar and wind power continues to fall, making them increasingly competitive. The renewable-energy industry is part of the broader “clean technology” sector that Prime Minister Justin Trudeau and Environment Minister Catherine McKenna argue will provide the jobs of the future. It includes a number of players: manufacturers, project developers, financiers and owners who buy existing generation assets for their long-term revenue streams. Across the country, local utility companies, municipalities and even farm groups are taking stakes in projects in order to generate revenue and local employment and to meet their own greenhouse gas-reduction goals. Indigenous communities have invested in clean-energy projects to help wean themselves off dirty diesel generators and to generate profits that can be invested back into the community. Renewable power – including large-scale hydro – is the fastest-growing component of the electricity industry globally. Last year, it accounted for 70 per cent of new generation, according to REN21, a French-based research organization. But without consistent market development at home, Canadian firms will have a hard time gaining a share of the international market, which is dominated by giants such as Siemens AG, General Electric Co., a handful of large Chinese solar-panel makers and international project developers such as Électricité de France S.A. (EDF) and Energias de Portugal S.A. (EDP). Nine years ago, then-premier Dalton McGuinty announced with great fanfare the introduction of the Green Energy Act. The legislation would not only result in a dramatic surge in renewable-energy construction, it would spur the development of a domestic manufacturing sector in a 21st-century industry. “Now, investors, renewable-energy companies and skilled workers can really move our green economy forward,” Mr. McGuinty said at the time. His government forecast that 50,000 renewable-energy jobs would be created and said that adding low-carbon electricity to the power grid would support the shutdown of the province’s greenhouse gas-emitting, coal-fired power plants. The government struck a $9.7-billion deal with a consortium led by South Korean-based Samsung to construct manufacturing plants in the province for renewable-energy contracts. Other companies also set up manufacturing facilities to benefit from the Green Energy Act, which required renewable-project developers to source 60 per cent of their content locally in order to benefit from lucrative subsidies. Like solar-panel makers Silfab Solar Inc. of Mississauga and Guelph-based Canadian Solar, Heliene used the activity generated by the act to build a business in Ontario. Following complaints from the European Union and Japan, the World Trade Organization ruled in 2013 that Ontario’s local-content requirement was illegal, so the provincial government dropped it. As a result, manufacturing operations set up to serve the provincial market found themselves competing head to head with industry giants. Several solar producers, including Heliene, pivoted to the U.S. market, where the solar industry is booming despite President Donald Trump’s political support for coal and nuclear. Solar and wind projects accounted for 56 per cent of new generation last year and fully 95 per cent in the first quarter of this year, according to consultancy Wood Mackenzie Ltd. Earlier this year, foreign solar-panel makers were slapped with a 30-per-cent tariff by the Trump administration. The tariffs hit the Ontario operations hard. The three companies launched a lawsuit that failed. The Canadian government is now pursuing a NAFTA arbitration panel, even as Mr. Trump pushes for a new trade deal that would exclude such remedies, while Heliene is seeking exemptions for its products from the Office of the U.S. Trade Representative. In the meantime, the tariffs solidified the case for the Minnesota production facility, and the company is hiring 130 people in Mountain Iron, a town of 3,000 in the northeastern part of the state. “We’re seeking every possible avenue to access the [U.S.] market from the Canadian facility,” Mr. Pochtaruk said. “In parallel, we have to manufacture in the U.S."
Most of what we have been doing in the last few years has been going into the U.S., because the Ontario market ceased to be attractive. But solar-panel manufacturers are not the only ones who unwisely counted on the promises of the Green Energy Act. Last summer, Siemens Gamesa Renewable Energy S.A. closed down a wind turbine plant in Tillsonburg, Ont., eliminating 340 well-paying jobs. A few months earlier, the plant had been transferred to Siemens Gamesa when Siemens A.G., the German parent company, merged its renewable-energy business with Spain’s Gamesa. The Tillsonburg plant produced some 2,000 wind-turbine blades for projects under Ontario’s Feed-in-Tariff Program – which allowed participants who generate renewable energy to sell it to the province at a guaranteed price – as well as projects in the United States and other provinces. But when the Ontario government cancelled a wind-energy procurement in 2016, the Siemens-Gamesa plant was slated for closure. The future of three other small manufacturing plants in London, Toronto and Windsor – all born out of the Green Energy Act – is also threatened. A few years ago, the province had 11 solar-panel manufacturers; that has dropped to three major ones, plus a couple of small-scale producers. At the peak, there were seven wind-component makers; there is only one shrunken operation left. And beyond Ontario, there is virtually no manufacturing capacity for renewables in Canada. 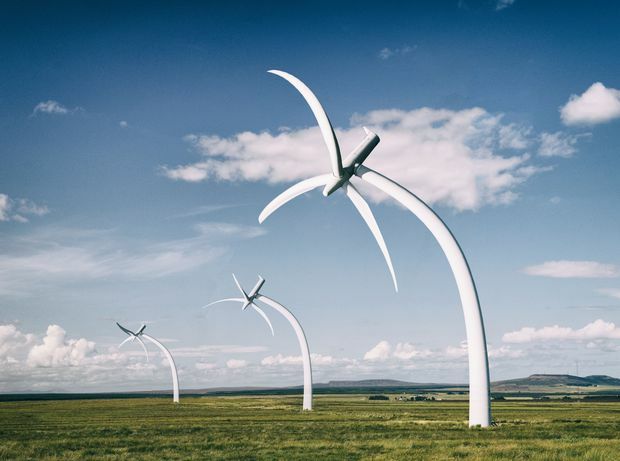 GE owns LM Wind Power, a blade manufacturer that employs 450 people in the Gaspé region of Quebec and has received US$5.7-million in loans and grants from the provincial government to support an expansion. Ontario and Quebec have long dominated the renewable-energy industry in Canada, along with strong activity in the smaller market of Nova Scotia. Now, Alberta and Saskatchewan are poised to take over as growth leaders. Ontario has roughly 4,500 megawatts of installed wind capacity, about 12 per cent of its generation capacity of 37,000 megawatts, according to the Independent Electricity System Operator – although actual energy production from those wind turbines fluctuates wildly. Alberta had 1,479 megawatts of wind capacity at the end of 2017 but expects to increase that dramatically as it phases out 6,300 megawatts of coal-fired power by 2030. Alberta Premier Rachel Notley has laid out a plan to replace coal with a mix of natural gas and renewable sources – 70 per cent and 30 per cent, respectively. Next door, the conservative Saskatchewan Party government has also set a target of 30-per-cent renewable generation for its electricity system by 2030. Project developers are flocking to those two provinces to compete for contracts. Alberta held a competition for 600 megawatts of power last year, and the four winning bids came in at an average price of 3.7 cents per kilowatt hour – far less than the 15 cents offered under Ontario’s original Feed-in-Tariff rates and still less than the 6.5 to 10.5 cents of more recent Ontario procurements. With more than a dozen companies bidding, the three winning firms were Edmonton’s Capital Power, with a 201-megawatt project, Portugal’s EDP with a 248-megawatt one and Italy’s Enel Green Power Canada, which proposed projects of 115 and 31 megawatts. Now, developers are gearing up for two more procurement opportunities in the province, a 300-megawatt round that must include Indigenous partners and a 400-megawatt round. Siemens Gamesa is among the companies that will be looking to bid for contracts in the Western provinces, said David Hickey, head of the company’s business in Canada. While the firm was not affected by Ontario’s cancellations, Mr. Hickey expressed concern that the Ford government’s actions are hurting investor confidence. Wind turbines against a blue sky. However, looming over the Alberta market is the spectre of the 2019 election and questions about whether a victorious Jason Kenney, the United Conservative Party Leader, will follow Mr. Ford’s lead and hammer the renewables sector or take his cue from Saskatchewan Premier Scott Moe and commit to an increased role for wind, solar, biomass and small hydro. Mr. Kenney has yet to announce whether he would continue with the scheduled coal phaseout – a policy that was advanced by former Conservative prime minister Stephen Harper and accelerated under the provincial NDP – or with the ambitious addition of renewable power. He has pledged to cancel the NDP’s carbon tax as one of his first acts should he take office – although that would trigger the imposition of the federal government’s levy – and he has highlighted the importance of reliability and affordability in the electricity system. Increasingly, developers are looking to work directly with large energy consumers to build renewables projects that are not dependent on provincial energy operators or government. The so-called “non-utility" generation comes from a number of sources, including corporations that have set internal greenhouse-gas-emission targets or companies looking to offset their obligation to pay carbon taxes by creating clean-energy credits. Ontario had been the big player, and it has essentially taken itself out of the game. Alberta is in major deployment mode, but the risk there is that you could have a change of government that could put the brakes on. — Mark Winfield, a professor of environmental studies at Toronto’s York University. In Alberta, there are a number of large companies developing their own renewable energy sources, a trend that is made easier by the deregulated nature of the market, Ms. Hastings-Simon said. Suncor Energy Inc., for example, has a portfolio of project sites in the early stages of development, with a focus on wind and solar applications in both Saskatchewan and Alberta, spokeswoman Nicole Fisher said. The portfolio has the potential to exceed 1,000 megawatts of new renewable energy in Western Canada, including the Hand Hills and Forty Mile projects in Alberta and the Shaunavon and Willow Bunch projects in Saskatchewan. Toronto-based RESCo Energy Inc. is focusing on that non-utility market to develop rooftop solar projects for corporate clients such as Sweden’s IKEA Group, which has a global commitment to produce as much renewable power as it consumes by 2020. RESCo has 60 megawatts of solar projects under management, most of which it built, and has a pipeline for more generation, company president Fidel Reijerse said. If the new Ontario government is serious about reducing electricity costs for businesses, ensuring they have the wherewithal to generate their own renewable power would provide an opportunity to deliver on that goal, he said. To better facilitate that, the government would need to follow through on promises to allow “net metering,” in which companies can generate their own power and sell surplus electricity but also rely on the grid when they cannot meet their own needs. Ontario now has a surplus of electricity but must plan for the day – forecast for the mid-2020s – when it needs new supply as its two biggest nuclear plants undergo simultaneous refurbishments. Renewable-energy developers insist they can be the low-cost option for that future need. While skeptics complain that renewable sources are not reliable, the industry insists the modern grid can easily manage a much greater percentage of renewable power.